Singer Justin Bieber developed a cult-like following all over the world when he burst on to the scene with his songs that he recorded on YouTube. Since his discovery in 2008, he has demonstrated his staying power by releasing a score of chart-topping tunes. He has worked with many other big-name artists including Ed Sheeran, Diplo and Skrillex. His biggest hits to date include Baby, Sorry and What Do You Mean? Who is Justin Bieber, how old is he, when is his birthday, how tall is he and what is his background? Justin Bieber is a 25-year-old singer/songwriter from Ontario, Canada. He was born on March 1, 1994 and stands at 1.75 metres. Justin came from humble beginnings, having grown up in Stratford, Ontario with his mother Pattie Mallette. He showed promising musical talents and taught himself to play many instruments, including trumpet, guitar, piano and drums. His mother started recording his attempts, and the pair posted these up on YouTube for the world to see. Why is Justin Bieber famous and what is his occupation? Justin Bieber’s fame soared after the release of his first album My World. His fresh-faced look and silky-smooth vocals were a winning combination – especially with the world’s teenagers, who were overtaken by ‘Bieber Fever’. What is Justin Bieber’s net worth? Justin Bieber’s net worth reportedly stands at $225million in 2017. How much does Justin Bieber earn? It is estimated that Bieber brings in $60million to $80million each year. He earns around $1million for every show he performs, which is similar to the figures that Bruce Springsteen and Madonna rake in. His income is also largely supplemented by brand endorsements; huge names like Calvin Klein and Adidas have paid for Justin’s stamp on their products. He also received $12 million from cosmetics company OPI to design a nail polish collection aimed at teen girls. Who is Justin Bieber dating, how long have they been dating for, what is his relationship history with Selena Gomez, why did Justin and Sofia Richie break up, who has he dated in the past? In October 2017, Justin Bieber and Selena Gomez appeared to reconcile their romantic relationship. He was alleged to have met Selena, his most renowned girlfriend to-date, through his manager. A few dates later, the two publicly announced their relationship at the Vanity Fair Oscars party in February 2011. They quickly became an adored couple by the public and their fans. However, the duo were not to last, and they broke up in November 2012 only to swing in and out of a relationship until their official split in November 2014. Justin was later seen spending time with actress Hailee Steinfeld and model Audreyana Michelle. He also had a casual relationship with Sofia Richie, daughter of Lionel Richie, in 2016 but it quickly faded away allegedly due to Justin’s feelings for Selena. The pair are reported to have split up, but neither Justin nor Selena have made any public comments about their reconciled relationship. What number one songs and albums has Justin Bieber released and when were they released? Justin Bieber’s top hits include his first track Baby, which was released in 2010 when he was just 16, making him the youngest male solo performer to reach number one. 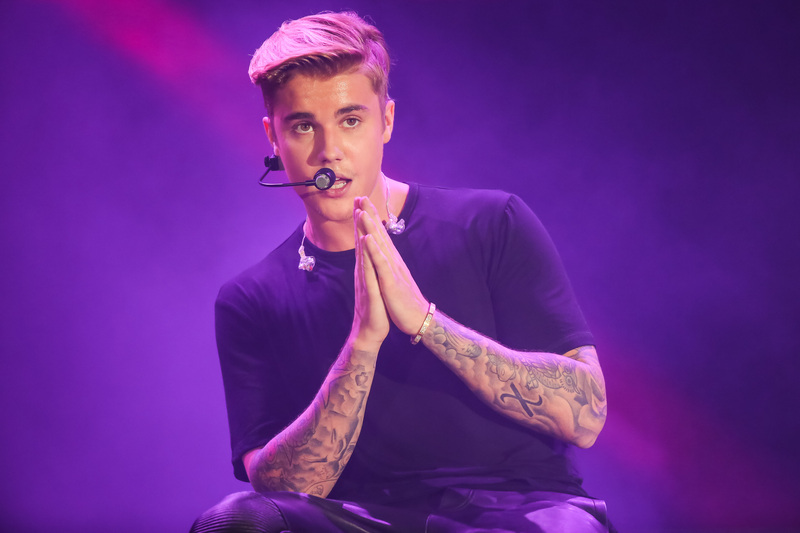 Sorry, released in 2015, was a track from Bieber’s album Purpose, in which he hinted at asking for forgiveness for his past bad-boy antics that he’d become known for. What Do You Mean? was released in 2015, and became a song that cemented Justin’s place at the top of the charts. The Despacito remix featuring Bieber, which came out in 2017, saw the star even dropping in a verse in Spanish. What awards has Justin Bieber won? Having received his first Grammy nominations in 2010, Justin has been nominated seven times and, as of 2016, lays claim to his own Grammy for Best Dance Recording for Where Are Ü Now. He has otherwise been nominated for 420 awards in total and has received a whopping 210. What is Justin Bieber’s Snapchat, Instagram and Twitter? Justin is spread across all social media accounts. His Instagram and Twitter handle is @justinbieber and his Snapchat is @rickthesizzle. What tattoos does Justin Bieber have? In 2017, Justin added a huge stomach and chest piece to his two sleeves of tattoo art. He worked with celebrity-favourite artist ‘Bang Bang’ to create the huge design featuring a skeleton, angels and windows. He adds this to the vast miscellany of motivational slogans and wild animal images spread across his body. Justin has inked a large crucifix in the centre of his chest and a delicate cross close to his left eye, in a nod to his faith. Teenage Bieber was publishing his own songs on Youtube when former-child-musician Usher came across his music. It had a hundred views, then a thousand views, then ten thousand views, so I just kept posting more videos and more videos. Both Usher and Justin Timberlake were keen on signing Bieber but eventually, Usher won the bidding war between the labels and Bieber was signed to Island Def Jam Recordings.